"Don't Throw the Baby Out with the Bath Water!" These were Johannes Kepler's words of warning which he placed on the title page of his great defense of astrology published in 1610. Like most of Kepler's astrological writings, this book was never translated into English -- until now. After many years of research and preparation, Ken Negus and Valerie Vaughan have produced the first complete English translation of Kepler's Tertius Interveniens (pronounced "ter-she-us intervene-yens") -- "The Third Man in the Middle." Kepler called himself a middleman because he was addressing his defense of astrology to extremists on both sides -- those who condemned astrology outright, and those who accepted everything about astrology (neither side using any critical thinking). 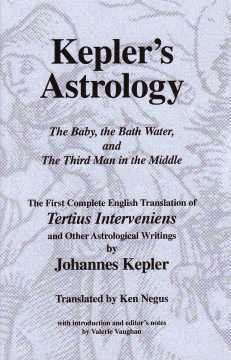 Kepler's intention was to reform astrology -- to throw out the superstitions (the "bathwater"), while still preserving the valuable principles (the "baby"). Kepler is of course well known as a scientist, but few people know that he was a serious student and practitioner of astrology. Very few of Kepler's astrological writings have ever been translated (or even published at all), mainly due to the overwhelming academic prejudice against astrology, which has amounted more or less to censorship. Academic scholars who know almost nothing about the complex subject of astrology have continued for over 100 years to mis-represent Kepler's astrological work as worthless mysticism, "hogwash," and something he was "forced" to do to support himself financially. One respected authority even suggested that we would all have a better opinion of Kepler if he had burnt this (astrological) material. With this kind of bias expressed by translators and scholars, one has to wonder how "clean" their translations are. It is thus quite a momentous occasion when Kepler's primary work on astrology has been translated by an actual expert in the subject -- Ken Negus -- a retired Professor of German Literature at Rutgers University and the president of the Astrological Society of Princeton, NJ, since 1972.